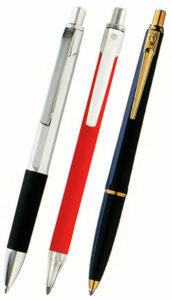 Nord Mark Inc. is pleased to offer the full line of Ballograf world famous writing instruments to registered retailers and marketing firms. We inventory all Ballograf products in the US, however for larger orders we import via air and can offer quick deliveries for any quantities. We also ship worldwide to any country not covered by existing Ballograf sales rep contracts. Smooth and skip-free writing using a tungsten ball (like a small golf ball) rotating in a stainless steel tip with 5 independent ink-delivery channels providing 26,000 feet of perfect ink delivery to almost any surface. Request a catalog or have your questions answered by calling us at 763-383-1118. Established wholesale customers can e-mail us at our Contact Us Page to place an order.